Viejos Tranvías Lisboetas (Lisboa), originally uploaded by Kaptah. In David Yoon’s Narrow Streets, the wide boulevards of Los Angeles are sliced in half. The city of drivers and speed becomes a place of walking and meandering intimacy. I will go out on a limb and state that single worst feature of Los Angeles is traffic. If we could find a way to get from one location to another, without our car, it would immensely increase the pleasure of life here. Today is Friday. People will be making plans tonight to go out this evening. How many will choose to stay home instead? Because one person lives in Century City, and another in Santa Clarita, and they planned to attend a play in Hollywood…. and want to meet for dinner at 6pm… but know it’s logistically almost impossible. It takes almost an hour, sometimes, to travel from West Los Angeles to Hollywood, a distance of only about 8 miles! 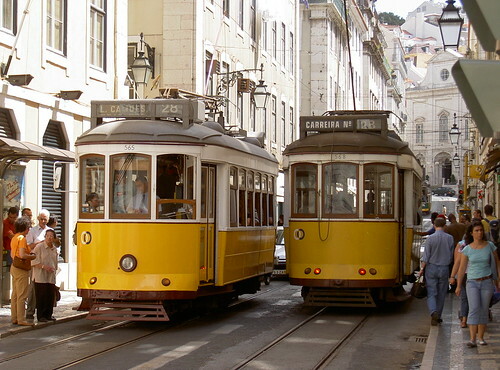 In Lisbon, Portugal, as in other progressive cities around the world, streetcars travel narrow streets and allow residents to travel without a car. In David Yoon’s Los Angeles, he has brilliantly photographed and retouched our environment and imagined how it might be transformed for pedestrians. We can also throw in public transportation and mix it with narrow streets. Just like poor Portugal has done. I’ve often wondered how V.N. would benefit from the implementation of a substantial light-rail system. The streets are definitely wide enough (Sherman Way, Van Nuys Bl, Sepulveda Bl, Balboa, Woodley Ave). I believe our “catepillar” bus lines are a good step, but still primative. Van Nuys has the means & opportunity to lead the rest of Los Angeles county towards a more progressive & efficient blending of modern transit w/ existing motorists & pedestrians. Van Nuys Blvd is “Exhibit A” for a wide boulevard improvement that utilizes light rail lines. Hey how did you know what we’re all doing on Friday evening? My friend is coming over to my place from West Hollywood and then we’re going down to Hollywood in one car…belching out whatever CO2 is needed to negotiate the 101 traffic. So LALA. At least you are all in one car.